I got the outdated neato_robot ROS package mostly working just by adding a timeout to its serial communications. But this only masked the symptom of an unknown problem with no understanding of why it failed. To understand what happened, I removed the timeout and add the standard Python debugging library to see where it had hung. I found the hang was getMotors() in neato_driver.py. It is waiting for my Neato to return all the motor parameters specified in the list xv11_motor_info. This list appears to reflect data returned by author’s Neato robot vacuum, but my Neato returns a much shorter list with only a partial overlap. Hence getMotors() waits forever for data that will never come. This is a downside of writing ROS code without full information from hardware maker: We could write code that works on our own Neato, but we would have no idea how responses differ across different robot vacuums, or how to write code to accommodate those variations. Turning attention back to this code, self.state is supposed to be filled with responses to the kind of data listed in xv11_motor_info. Once I added a timeout, though, getMotors() breaks out of its for loop with incomplete data in self.state. How would this missing information manifest? What behavior does it change for the robot? Next I need to see if there are other similar problems in this code. I changed xv11_motor_info list of parameters to match those returned by my Neato. Now getMotors() will work as originally intended and cycle through all the parameters returned by my Neato (even though it only needs two of them.) If this change to neato_robot package still hangs without a timeout, I know there are similar problems hiding elsewhere in this package. If my modification allow it to run without a timeout, I’ll know there aren’t any others I need to go hunt for. Experiment result: success! There are no other hangs requiring a timeout to break out of their loop. This was encouraging, so I removed import pdb. Unfortunately, that removal caused the code to hang again. Unlike the now-understood problem, adding a timeout does not restore functionality. Removal of debugger package isn’t supposed to affect behavior, but when it does, it usually implies a threading or related timing issue in the code. This one will be annoying as the hang only manifests without Python’s debugging library, which meant I’d have to track it down without debugger support. While I’m making my way learning how to write proper modules for Robot Operating System, the rest of my SGVHAK compatriots have not been twiddling their thumbs waiting. Just like I went and built Sawppy as my idea of a cool rover project, Dave designed and built Mr. Blue as his idea of a cool rover. All the blue printed plastic parts (which gave this rover its name) was designed in Dave’s preferred CAD software OpenSCAD. These pieces connect thin wall aluminum tubing that is very strong yet quite affordable. Making this rover a great exploration into a construction method quite different from Sawppy, where I designed 3D-printed plastic components in Onshape CAD and they connected Misumi aluminum extrusion beams. Mr. Blue also expresses Dave’s ability to design and build electronics circuits. Where my Sawppy used serial bus servos, Dave has custom controller boards driving all the motors. There are two types on board: one drives a DC motor with feedback provided by optical quadrature encoders, the other drives a commodity servo motor but with precise position feedback via high-resolution magnetic encoders. In both cases, they feed into a 3D-printed gearbox for additional mechanical reduction. SGVHAK Rover is running on RoboClaw controllers by Basic Micro. Sawppy is running on LewanSoul serial bus servos. Mr. Blue is running on Dave’s own custom controller boards. We have quite a rover family going! The great thing about ROS is that it is a popular and open platform for everyone to work with, resulting in a large ecosystem of modules that cover a majority of robot hardware. But being so open to everyone does have a few downsides, because not everyone has the same resources to develop and maintain their ROS modules. This means some modules fall out of date faster than others, or works with its author’s version of hardware but not another version. Such turned out to be the case for the existing neato_robot ROS package, which was created years ago and while the author kept updated it through four ROS releases, that maintenance effort stopped and so this code is now five releases behind latest ROS. That in itself is not necessarily a problem – Open Source Robotics Foundation tries to keep ROS backwards compatible as much as they can – but it does mean potential for hidden gotchas. When I followed instructions for installation and running, the first error message was about configuring the serial port which was fine. But after that… nothing. No information published to /odom or /base_scan, and no response to command sent to /cmd_vel. Digging into the source code, the first thing to catch my attention was that the code opened a serial port for communication but did not set provision for timeout. Any problem in serial communication will cause it to hang, which is exactly what it is doing now. Adding a timeout is a quick and easy way to test if this is actually related. And that was indeed helpful, restoring nominal functionality to the ROS node. I could now drive the robot vacuum by sending commands to /cmd_vel and I can see a stream of data published to /odom and /base_scan. I briefly contemplated being lazy and stopping there, but I thought I should try to better understand the failure. Onward to debugging! Now that we’ve got a pretty good handle on getting old Neato robot vacuums up and running, including talking to their brains via USB, it’s time to dig into the software side and explore its potential. I could adapt my SGVHAK rover code to control a Neato, but I think it’s more interesting to get my Neato up and running on ROS. Unsurprisingly, there already exists a neato_robot ROS package for Neato. Equally unsurprisingly, it was maintained up to ROS Hydro and since abandoned. ROS releases are named alphabetically, meaning this code is three releases behind my installation of ROS Kinetic and a whopping five releases behind the current state of the art ROS Melodic. But hey, it’s all open source, if I want to get it to function all I need to do is roll up my sleeves and get to work. Since it’s out of date, I think it’d be a bad idea to grab the pre built package. Instead I followed links to its source code repository (last updated October 2014) and cloned it into my local catkin workspace. And continuing on the trend of not being surprised, this code did not work immediately. Publishing events to /cmd_vel topic did not elicit robot chassis movement, and subscribing to /odom or /base_scan received no data. Fortunately this node was written in Python, which I hope would be easier to debug than a ROS node written in C++. But either way, it’s time to dig in and figure out what it is doing and how that differs from what it is supposed to be doing. It’s been a few months since I declared Sawppy version 1.0 complete and documented. A project like this is never done and there’s always more to do, but I had reached a good milestone in mechanical design supported by “good enough” electronics driven by software borrowed from another rover project. I released it open source to the world, curious what would happen next. I was very happy to see people go beyond just talking about building their own Sawppy, and have gone ahead and actually done so. In the course of their builds, people have reached out to me with questions about the information I’ve published, which I welcome. It’s always good to have extra sets of eyes to look over what I’ve written. Sawppy documentation is my best effort, but it’s very easy for me to overlook gaps in information because it’s all in my head and my brain doesn’t necessarily notice when something crucial is missing. Having other people try it out and letting me know of their experience is the best real world test, and I add clarifications in response. As for software, SGVHAK Rover’s adapted software was always intended as a placeholder, not the long term software solution for Sawppy. Indeed the first three Sawppy builds I’m aware of didn’t use that software, either. Two builders have written their own rover software, and a third has wired up their Sawppy for standard remote control. Nevertheless, some Sawppy builders want to use what works today so I should put in the time to write more detailed instructions on how to adapt that code to drive Sawppy. In the immediate present, user feedback has alerted me to an embarrassing bug that I’ve since fixed. It’s not my first public embarrassment, it won’t be the last. I encourage asking questions in public so my public answer will be useful to others as well. Go to Sawppy’s Hackaday.io page, click on “Discussion“, and add your comment. If you rather not comment in public, you can send me a private message. From Sawppy’s Hackaday.io page, click on my name up top to reach my Hackaday.io profile, and click “Send a private message”. File an issue on Sawppy’s Github repository. And finally, my favorite: not just file an issue, but also send me your proposed solution via a pull request! Let’s work together to make Sawppy better. When I found my Neato XV-21 in a thrift store, it wouldn’t power on and it didn’t have its charging dock. I originally thought I would buy it just for parts but it’s been a long and interesting adventure poking at how these robot vacuums worked. I made enough progress to catch [Emily]’s interest, who saw another Neato robot vacuum in a thrift store and bought it. Hers had the advantage of a charging dock so we could open one up to see how it worked. Armed with that knowledge, I thought I’d try to build my own replacement charging dock for my Neato XV-21. I bought two 24V DC power supplies similar to that inside a Neato charging dock at the W6TRW swap meet. Since I didn’t have a good way to make contact with a Neato’s charging strips, I opened up my robot vacuum and rigged up a test configuration using clip leads on my crowded workbench. The first candidate was a power supply with HP branding. The HP power supply label said 24V @ 1.5A, which is slightly lower than 24V @ 1.67A listed on the supply inside a Neato dock, but I thought it was worth a try. First I verified the open circuit voltage was 24V, then I clipped it to the vacuum. The Neato woke up as if it saw a power source, but two seconds later it acted as if the power source went away. The output voltage on the power supply had dropped to under 1V and remained there. I thought maybe I burned out something, but if I unplug the power supply and plug it back in, its output open circuit voltage was back up to 24V. This behavior indicated no permanent damage was done, but that I had tripped some sort of internal protection mechanism. I then did what, in hindsight, I should have done as my first step: tried charging my vacuum with a bench power supply. I set the dials to 24V and 1.67A, like the label on Neato charging dock’s power supply, and hooked up the wires. My bench power supply immediately hit the current limit I had set, and voltage has sagged to a little over 14V. Since that’s within the range of NiMH battery voltage, it appears the Neato had connected its DC input directly into its batteries. NiMH batteries are fairly durable so this isn’t necessarily a horrible thing to do in and of itself. But it does mean the Neato will happily soak up more than the rated power of its power supply. Which explains the HP power supply behavior: it is an over-current protection mechanism that is great for safety in case of short circuits but inconvenient for trying to charge a Neato. 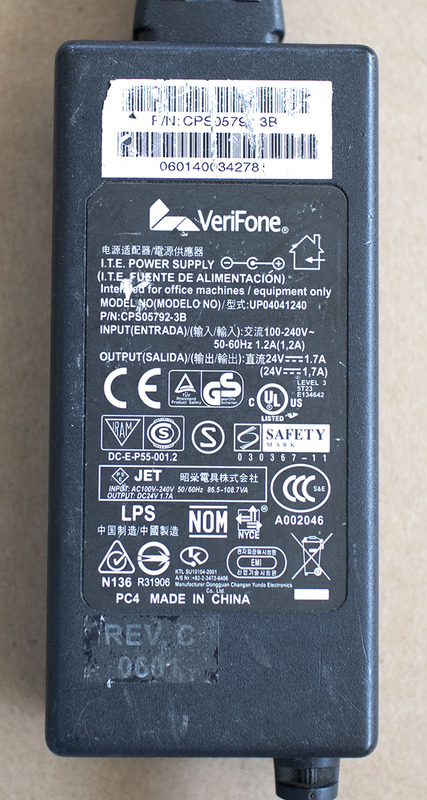 The second salvaged power supply had VeriFone branding and claimed it is capable of 24V @ 1.7A. This is better than the unit inside a Neato, but now we know this is only part of the story. The real question is how it behaves when connected to something that draws more than its rated 1.7A. Does this also have an over-current protection mechanism? The answer is yes. Again its open circuit voltage is 24V as advertised, but once wired to a Neato, the voltage collapses to around 12. 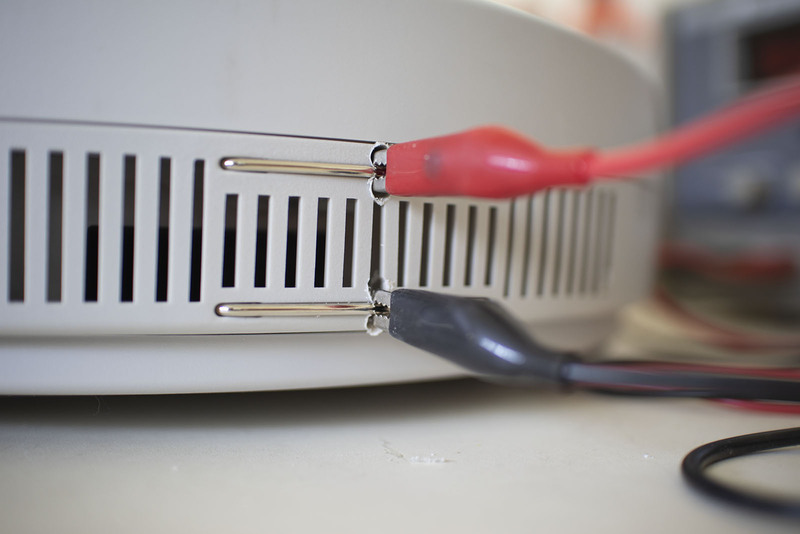 After collapse, it quickly builds up to about 15, then the voltage collapses again. The Neato is very optimistic, showing itself to be charging, but there is negligible actual progress in charging the battery. But now that I know the current capacity is the limiting concern, maybe another power supply with higher amperage limits will work even if its maximum voltage is lower than 24 Volts. So I pulled out an old salvaged Dell power supply that only claims to deliver 19.5 V but could do so at 3.34 A. I verified its open circuit voltage was over 19 V, connected it to a Neato, which again woke up thinking there’s a charger. But once power started flowing, output voltage collapsed to 7.5V and remained there until a power cycle like the HP power supply did. Out of three DC power adapters that should have worked on paper, zero actually worked for charging my Neato vacuum because the Neato drew far more than their rated amperage. So for the immediate future, my Neato charging will be done with my bench power supply. To make this easier, I made an easy (if not particularly pretty) modification to my Neato vacuum. 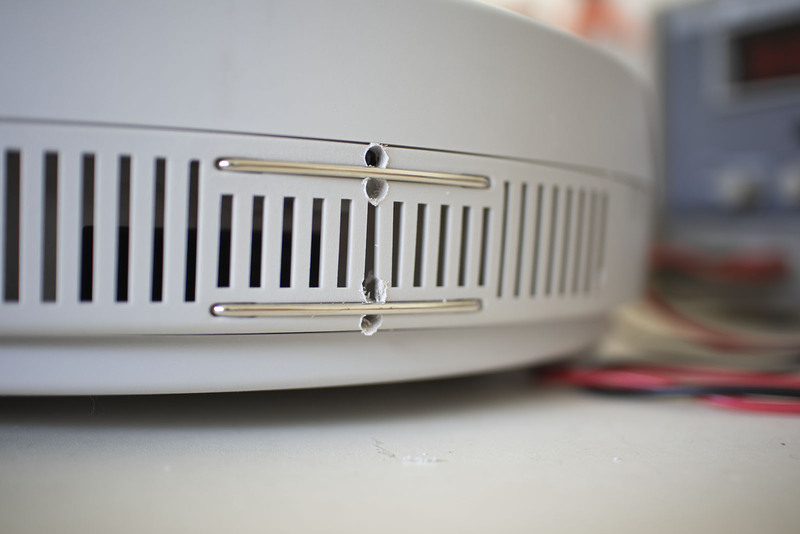 Two holes were drilled on each side of a charging contact. Something I now have the confidence to do, because I’ve taken apart the charging contacts and saw there were no critical parts at risk. With these holes drilled, it was easy to connect my bench power supply’s alligator clip leads for charging. The second downside of this approach is that, in case of steering couplers, a replacement would not be identical. Steering trim would be slightly different with a replacement coupler due to natural variation from unit to unit. When I perform this replacement, I would also have to adjust Sawppy’s steering trim for proper operation. But in an emergency? It’ll probably be close enough. A Neato robot vacuum in their initial XV series product line is powered by a pair of identical 6-cell NiMH battery packs. 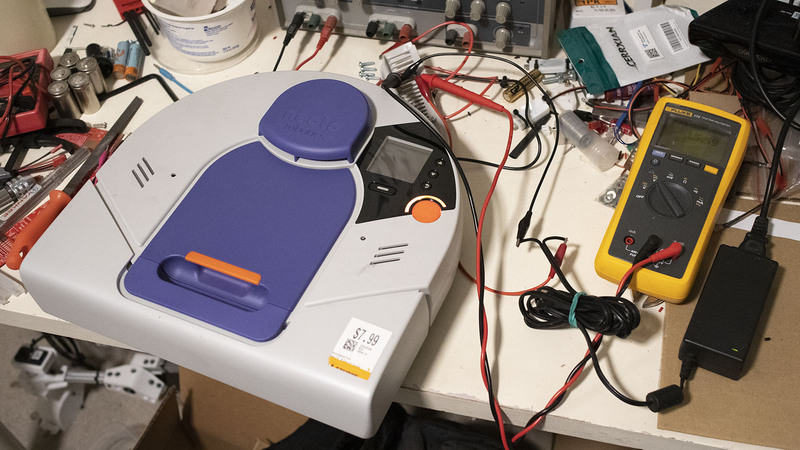 When I picked up my XV-21 from a local thrift store it did not power up, a fault which I’ve isolated to its failed battery packs which I’ve since replaced to get the whole system back up and running with help of [Emily]’s loan of Neato charging dock. When I evaluated my battery replacement options earlier, one was to buy new cells and rebuild the pair of packs myself. I rejected that option because new cells actually would have cost more than pre-built replacement packs. But since then Emily found a second thrift store Neato, a XV-12 with its own failing battery pack. This makes a total of four identical 6-cell NiMH battery packs. What are the chances we have sufficient good-enough NiMH cells in this pile for one set of healthy batteries? It costs nothing but a bit of time, well within the spirit of the kind of projects we tackle at SGVHAK meetups, and so it’s worth a shot. First, the XV-12 battery packs were trickle charged overnight to get a sense of their capabilities, just like I did for XV-21 batteries earlier. Fortunately, the self-discharge profile looked promising. Pack A: 7.93V self discharged to 7.64V after a few days. Pack B: 6.59V self discharged to 5.98V after a few days. Judging on voltage level alone, pack A is in better shape than pack B. The latter shows signs of having one completely dead cell. They’re certainly in far better shape than XV-21 battery pack. Out of 12 cells, only 1 held itself at ~1.3V after a week. The rest all self-discharged to a level ranging from 0.9V to flat zero after a few days. So we disassembled pack B and deployed a volt meter to verify there is one cell that could only deliver around 0.1V. This cell was marked with an X and removed from the pack. Since we don’t have a battery spot welder available, we took care to make sure we keep the tabs on this pack. The only not-dead cell from the XV-21 pack was marked with a check and removed from its pack. And again we took care to keep the battery tabs, this time making sure it stays with the ‘good’ cell. With the battery tabs intact, it was easy to solder a new pack together. When we turned on the robot vacuum, it no longer displayed a battery issue error screen, which is a great sign. We then left the robot sitting on its charger for about half an hour, then pressed the big red button to start a vacuum cycle. The vacuum suction motor turned on (Yay!) the brush motor turned on (Yay!) the robot started to move (Yay!) and then it went dark. (Noooo!) When we tried turning it back on, the error screen returned. Our little cell-swapping experiment did not result in a battery pack capable of running a Neato. It might find a future life powering low drain electronics projects, but it wasn’t enough to run a robot vacuum’s high drain motors. Emily ended up buying new battery packs as well to restore her XV-12 back to running condition. So now that we have the entire Neato robot vacuum system including charging dock, it’s time to see how did they perform at the job they were built to do. Not that their performance was important, as I bought my Neato intending to scavenge it for parts and it was only a happy accident to end up with a fully functioning robot vacuum. But before I start having fun with robot experiments, I should at least see how it works in its original capacity. Mostly just from curiosity, but if I’m going to show up at places with a modified robot vacuum, I also expect to be asked by people if it’s worthwhile to buy one to vacuum their home. Those who paid full price for their robot vacuums will have very different expectations from people like Emily and I who picked up our robot vacuums for cheap at a thrift store. And naturally a little robot vacuum would not be able to move furniture out of the way. For example, floor under the dining table is not vacuumed, because the dining chairs legs all around the table blocked access. But it turned out the dining table itself was an obstacle. Just as my earlier experiment with Neato scanner had problem seeing certain furniture features, an actual Neato was unable to see the ramp-like shape of my dining table legs and managed to launch itself into an awkward angle and got stuck. As a home of a tinkerer, my house had many other features unfriendly to robot vacuums. My Neato kept getting itself tangled up in power cords for various AC-powered electronics gadgets, and of course there are piles of stuff all around the house in odd shapes, some of which share the “important features are out of sight of laser scanner” problem with office chair and dining table. There may be homes where a Neato would be a productive little housekeeping worker, but I’m afraid my home is just too much of a hazardous environment for this little Neato to be effective. Which is great! I now feel less guilty about relieving it of vacuum duty and put it back to work for the reason I bought it: as a chassis for robotics projects. But it was fun to see a Neato in action doing its job. It was enlightening to see its own mapping and routing software at work, a benchmark to compare against for my own code driving this chassis. It is a really endearing little robot, with friendly messages on its LCD screen and my favorite part: the way it cuddles its charging dock. And now that one Neato is back up to full running condition, [Emily] and I will team up and try to get them both running. Shortly after SGVHAK Rover was completed last March, it also made an appearance at California Institute of Technology’s Science for March event organized by the Caltech Postdoc Association. The rover was well received and we’re going to do it again for this year’s event taking place tomorrow. This event is free and you can register here. We were but young rover herders at last year’s appearance, and there were some durability issues that we think we’ve addressed. I’ve taken some of those lessons to heart with my own Sawppy rover, which was only a dream at last year’s event but this year will be one of several rovers joining in the festivities. During our outing at the Downtown Los Angeles (DTLA) Mini Maker Faire, we saw familiar faces from our local friends at Caltech and also nearby Pasadena City College (PCC) and we hope to see them again this year. The weather forecast is sunny and clear, it should be a good time! Such is the case now. One member of RSSC accepted my invitation to build a Sawppy after my presentation in January, and submitted the feedback that I need to post a schematic of how I’ve wired up Sawppy. I previously submitted this answer as response to a comment on the Hackaday.io project page, but more detail was needed. Since my sample schematic is fairly simple, it only took about an hour to go from absolute beginner to the schematic I wanted to create. I could (and did) choose to share the project file publicly via a URL, though it appears accessing the project requires logging in to Scheme-It, which required a Digi-Key account as previously mentioned. I could also export to PDF or PNG formats. The PDF export feature was unsatisfactory. Many labels were moved out-of-place making the schematic illegible. In contrast the PNG export looks OK so I’ve posted this schematic PNG to Sawppy’s Hackaday.io project page, as well as Sawppy’s assembly instructions hosted on Github. The Neato XV-21 I found at a thrift store has bee joined by a XV-12 found by [Emily]. Both Neato robot vacuums found at thrift stores have degraded batteries. This was not a surprise as robot vacuums work their battery packs hard. Not just frequent charge and discharge cycles, but with a heavy power draw under use to run vacuum motors. This means both of these vacuums were retired by their previous owners when the battery no longer hold enough charge to perform its duties. Fortunately, this common failure also meant there’s a robust aftermarket for replacement batteries. Curiously, the economics of the markets are such that whole replacement packs can be ordered online for less than ordering individual cells and rebuilding the packs myself. With previous experiments, I have gained confidence I can verify functionality of individual components using test mode accessible via USB port. And since this XV-12 was found with an official Neato charging dock, it’s time to install replacement batteries and test the full system. 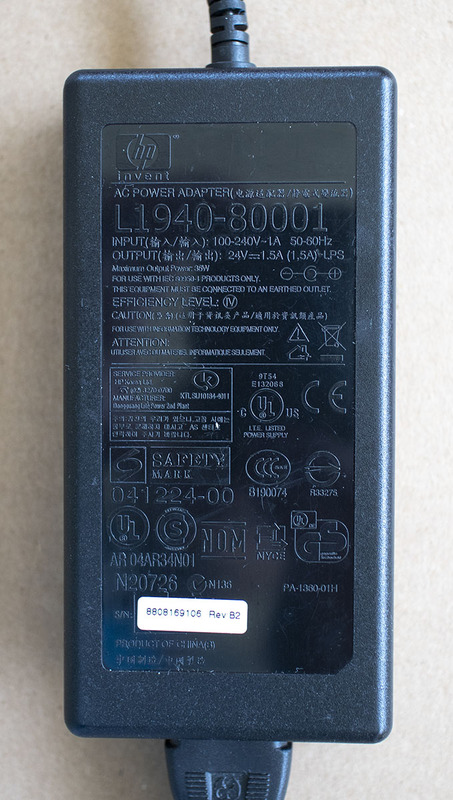 The replacement batteries claim a capacity of 4000mAh which, on paper, is an increase from the original battery’s label capacity of 3800mAh. However, battery manufacturers play pretty loosely with these ratings so I expect the difference of 200mAh to be fairly insignificant in practice. When I took apart the original pack, I saw a thermister for monitoring temperature, an overcurrent protection fuse, and an overheat fuse. I assume the replacement pack has a thermister because the Neato computer can read it, but there’s no immediate way to tell if the overcurrent or overheat protection also exists on the new pack. With new battery packs installed, it’s time to put the robot up against the charging dock and verify the charging system works as expected. But before we do that, let’s take a closer look at this charging dock. The Neato was barely used. A Neato is very good at keeping itself clean. Thanks to a second Neato found in a thrift shop, this time a XV-12, we now know #3 is false. This one is well used, and very much looked it! The previous owner didn’t bother cleaning the vacuum before dropping it off at the thrift store. I have several loops of hair tangled up in the roller brush. The largest loop has even snagged what looked like furniture padding foam. The largest loop has also tightened enough to damage the roller brush. Once I cut that loop of hair and debris off the roller brush, I see a slot cut into the rubbery blade. There was also debris tangled on the motor shaft driving this roller that had to be cleaned off before the roller brush could function properly again. The cavity for the roller brush showed extensive wear from a life as a working household vacuum (above), whereas the XV-21 showed barely any wear (below). Those were problems found on the suction side of the vacuum. What about the exhaust side? The vacuum is generated by a fan which sat downstream from the dust bin filter, so its cleaniness would be a clue at how effective the filter was. Everything seen here are dirt particles that have made their way past the filter. But even though this vacuum lived a harder life, its battery was actually in better condition and could run the vacuum computer for several minutes before fading out. As a result I was able to query all components individually using its USB port without having to hack a battery into this vacuum. All signs indicate that this robot vacuum is likely fully functional except for its battery. And fortunately, with the arrival of replacement battery packs, we don’t need to drill holes and hack external battery packs for a full system test. We can install the new batteries into this XV-12.